2011 is fast becoming one of the most tumultuous years in recent memory, with revolutions and economic storms abroad paired with scandal and political tensions at home. Now to cap it off, the spectre of major urban violence has reared its ugly head in London and across England for the first time in three decades. Whilst freedom fighters in the Arab world are using social networking to overthrow dictators, a section of London’s youth have been coordinating the overthrow of their local JD Sports and Curry’s via Blackberry Messenger. All this a year before the 2012 Olympics, which London secured based on its promotion of equality and diversity. As is common, such events appear predictable with hindsight. The pattern of urban violence sparked by a controversial death of a police suspect is shared with recent riot events in Paris and in Athens. Unrest is more common during economic downturns, as explored in a topical discussion paper by Ponticelli and Voth. London is, like all world cities, increasingly polarised between affluent classes of knowledge economy workers and households struggling to make ends meet on low paid work or benefits. The Prime Minister has been making sweeping claims about the “Broken Society”, gangs and family breakdown. I want to look at a simpler relationship here- the geography of unemployment in London and where the riots occurred. 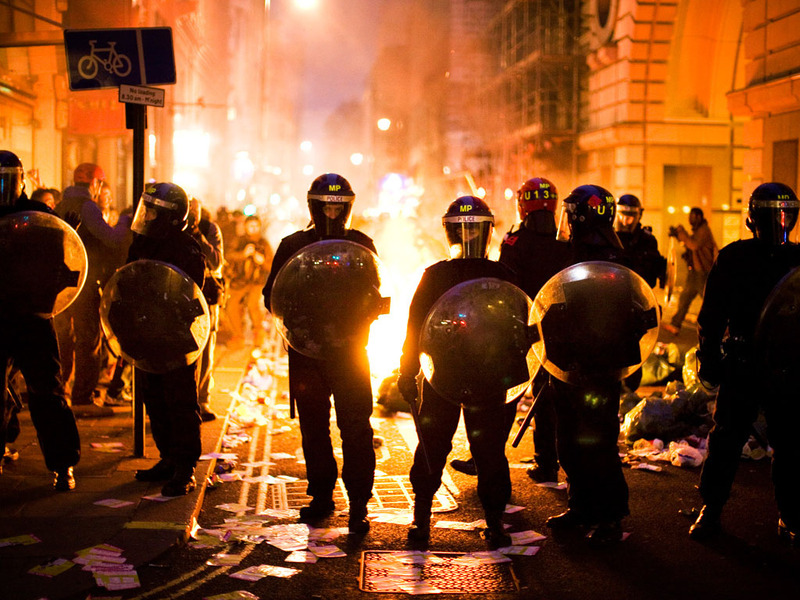 The rioters were overwhelmingly male, between the ages of 18-25 and jobless (according to the Guardian data blog). It has been said repeatedly the rioters lack a “stake in society”, and presumably being isolated from work and education is a major factor in breaking links between individuals and their wider communities. The map below shows the proportion of 16-65 year olds claiming unemployment benefit in 2011. The total has increased from 150,000 to 225,000 in the last four years. Locations of disturbances according to data from the Guardian are shown with purple dots. There are strong unemployment concentrations in a number of town centres that suffered disturbances, including Tottenham, Enfield, Hackney and Brixton. On the other hand some locations where trouble occurred, such as Ealing and Camden, are not highlighted. It would be useful to map the residential location of those arrested rather than the riot location, as people can of course commit crime outside of their neighbourhood, but this data is not currently available in a comprehensive form. We can also look at changes in unemployment rates, as shown below between 2005 and 2011. Again Haringey and Enfield have suffered badly, along with further concentration in Croydon, Newham and Brent. Finally we look at youth unemployment, with total unemployment under the age of 25 shown below. This was not available as a percentage and is instead shown as a raw count for wards. Again Tottenham and Enfield appear, and further clusters are highlighted in Peckham, Woolwich, Brixton and Brent. Clearly the causes of the riots and looting in London are multiple and complex, and there is no magic key for preventing such horrific events happening again. But I do believe unemployment is a significant underlying factor, and one which the current recession is inevitably exacerbating. Similar levels of high urban unemployment are also evident in the disturbance hit cities of Birmingham, Manchester, Liverpool and Belfast (see the BBC for a useful national map). In the London context, there is large scale regeneration and local job opportunities occurring in Tower Hamlets and Newham, and it looks like similar efforts need to be stepped up in other deprived areas of London. The London government, the GLA, are aware of these problems and have been boosting apprenticeship schemes and supporting local town centres. Unfortunately recent patterns of employment change and development have left much of Outer London behind, with growth mainly in Central London, the west and the Wider South East. This will be discussed further in future posts.